This grilled bread is a must to accompany dishes that have a nice broth or sauce to sop up, like a cioppino or a ragu sauce. Have all ingredients ready for the grill. Slice your bread into 1 inch slices. Grill on each side. While hot, rub each slice on one side with the cut side of a garlic clove. 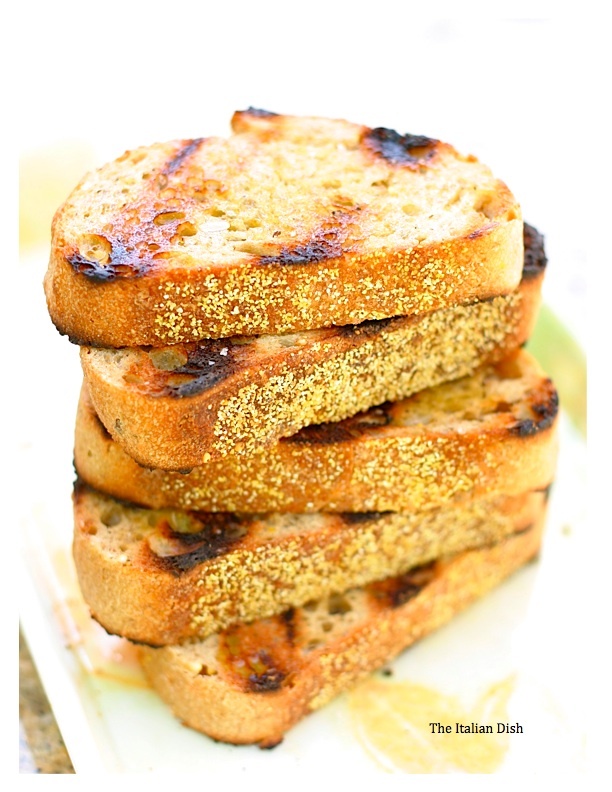 Drizzle olive oil over the slices and sprinkle with a generous amount of sea salt. Rub the cut side of the garlic clove on the hot bread. Brush with lots of good olive oil. See this wonderful gadget? My lovely and thoughtful sister-in-law, Deb, gave this to me and I love it. I used to pour some olive oil into a little bowl and use a pastry brush to apply the olive oil, but now I use this thing. It's called an Oil Wand and I use it for many things. It always has olive oil in it and I can grab it quickly when I need it. Thanks, Deb! * The salt I use is my favorite salt - it's an Italian sea salt from the Adriatic Coast sold by Casina Rossa. It's a great finishing salt. I love good salts - they add so much to your cooking. Rick Bayless said that most home cooks make two common mistakes: they don't cook over high enough heat and they don't use enough salt on their food. If you love to try new salts, head on over to The Meadow. The Bittermans sell gourmet salts, exotic chocolates and wine in Portland, Oregon. Doesn't that sound like a great place? We are making a trip out to Oregon next month and I plan on stopping by and loading up on salt, for sure, and whatever else we can't do without. I can hardly wait. Jump on over there and check out their beautiful web site. love it! we make this at culinary school and I seriously eat the entire loaf of bread every time! This is how my father used to make his garlic bread. Looks great! You pretty much had me at garlic bread. that oil wand is brilliant. thanks for the recommendation. 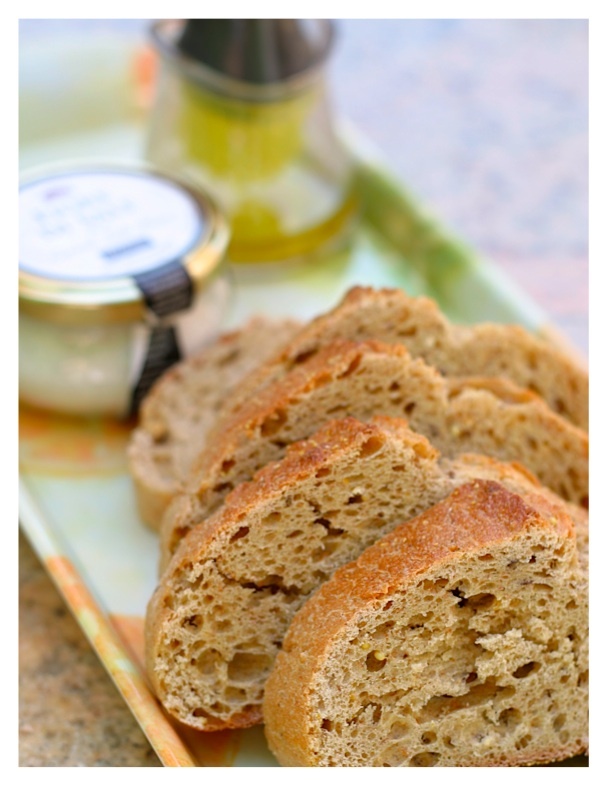 Okay, you had me at grilled bread bathed in garlic and olive oil, finished with sea salt. But when you mention Rick Bayless, then I'm truly hooked! When I started my love affair with Italian food (making my own pasta), I tried this technique for making Italian bread on my family (also from MI). The results were mixed, as raw garlic didn't sit well with some. I remember it being heavenly, and need to revisit. Thanks for the reminder! No toppings neede for this one!!!! The aroma of good olive oil is what needs to be showcased on these slices. Great job! 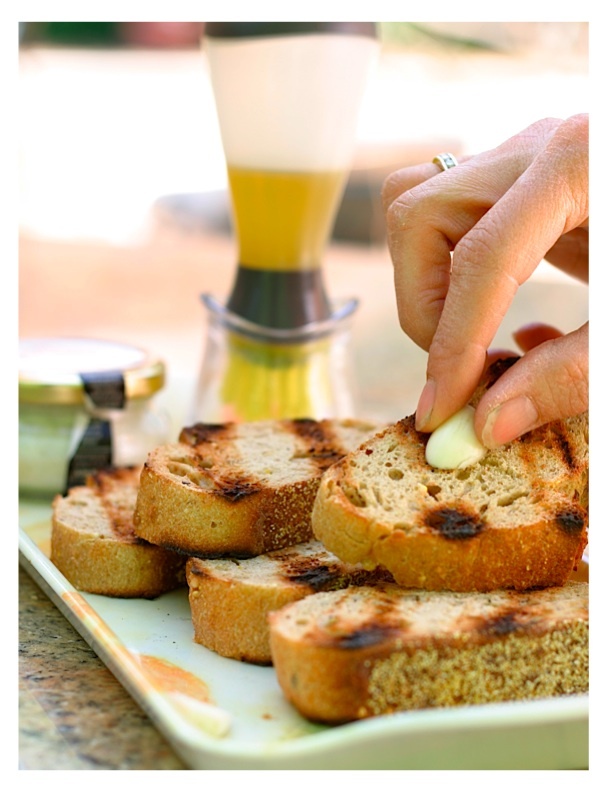 This is the ultimate garlic bread: uninterrupted flavour! I'm Italian and I love Fettunta, also called Bruschetta. 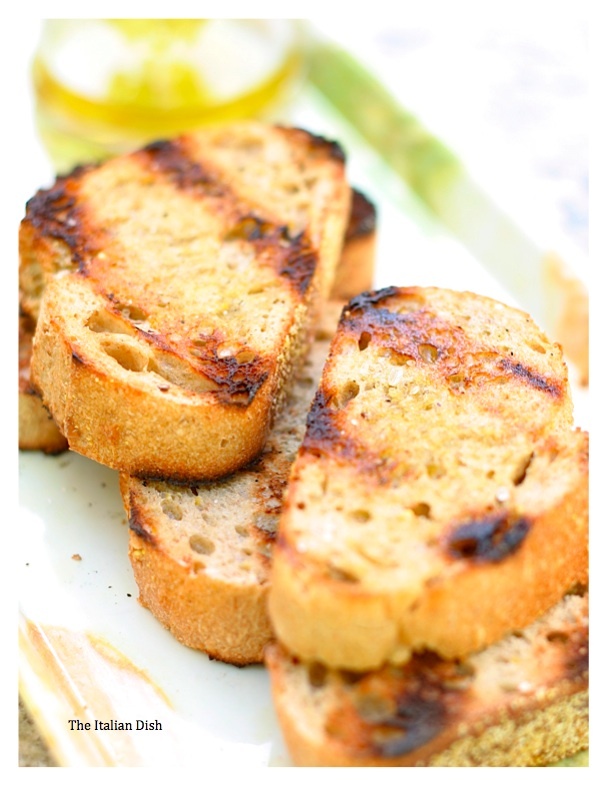 A delicious dish for our dinner..grilled bread, extra vergine olive oil and salt. I like your blog. I've founded a lot of italian recipes and beautiful photos. Oh Elaine, you know how much we KY Schurr's love bread!! Any chance you'll be making this while we're visiting over the 4th? I can't wait to make it myself and I have to get an Oil Wand! How thoughtful of Deb. My grandfather used to rub garlic cloves on dark Russian bread and sprinkle it with sea salt. I still remember the smell in the house. I'm definitely going to do this over the summer! 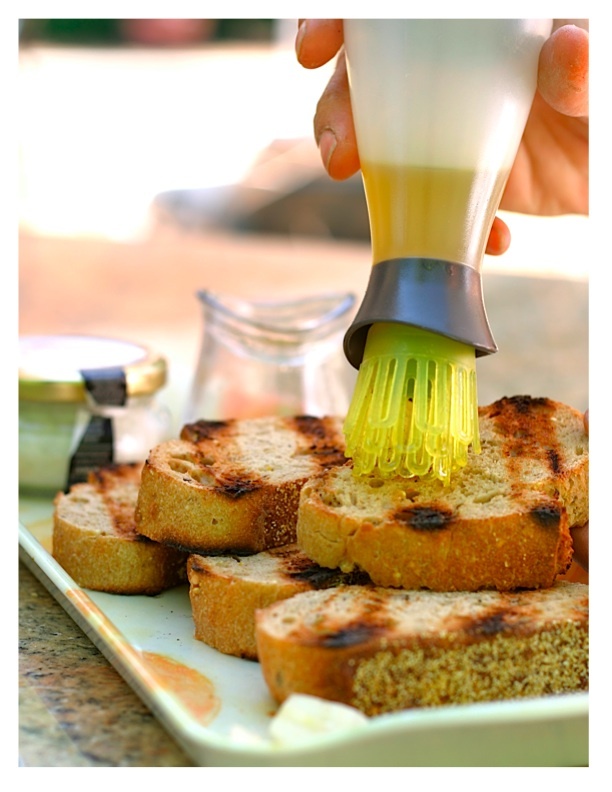 This is by far the best way to make garlic bread, IMHO. I love the oil wand. Oh, no, another toy to order! I love your oil wand. I've got to get one of those. I'm going to try this. It looks and sounds so wonderful! Elaine, You can make the simpliest things extraordinary! I love the look of your blog too,it looks so fresh! ok, I need that oil wand ASAP! Nice SIL! Simplicity at its best. Love the oil wand! I want the oil wand! That is great, thanks! Love your blog! Lovely, I am so glad I found your site!! We eat bruschetta for dinner many times during the summer when the tomatoes are fresh, this makes me long for a hot, fresh loaf of bread, just to rub garlic and dunk in some good oil. Oh, thanks for showing the oil wand, I will definitely check that out, I don't like the pastry brushes, and I have a little silicone brush that I have tried, and it is so messy. Keep up the beautiful pictures, they are always and inspiration. I have been to the Meadow and it is a wonderland of salt, spices, and flowers! Do go when you visit Portland. That neighborhood is funky and up and coming--there is a gardening store next door and chickens were wandering around. We had some great barbecue from a guy cooking it on a pit trailer in a vacant lot and had a great coffee (complete with an artistic foam swirl ala barista-style) at Stumptown Coffee. I brought home several jars of salt from around the world. Couldn't agree more with Mr. Bayless that one of the essentials of good cooking is using the exact right amount of salt (no more, no less) than the ingredients and dish requires--it's a tricky business and involves a confluence of tasting and instinct and experience! By far my favorite way to eat bread. The first time I had it was with my Dad in a place outside Rome in 1978. They put the bread slices on sticks and grilled it over an open fire! Love the oil wand!